In this posture, we experience a luxurious myofasical release of the lateral line. The tissue along the ribs, abdomen and hips lengthen and become more pliable. What I most appreciate about this posture is the effect on diaphragmatic excursion by increasing rib mobility. The quadratus lumborum (QL) is a muscle in the back that connects the iliac crest (what you touch when you put your hands on your hips) and the twelfth rib. The QL can be thought of as an anchor for the diaphragm, since almost half of the muscle fibers are used for that function. When working with clients with persistent pain in the pelvic, back, shoulder, or neck pain, I see the body’s tendency to protect by increasing stiffness and rigidity in the body. We can free the breath, via the ribs and spine. This decreases superficial muscle over-activity and works towards reprogramming the nervous system. Stand with your feet hip distance apart, in Mountain Pose. Inhale, draw the arms out to your side and overhead. If your hands touch, make a steeple sign. Otherwise, you can use a strap or towel. Inhale, bringing your torso and arms to the right. As you try this movement to the right and the left be sure to ground your feet, especially the foot opposite of the direction of the hands. Imagine you are gently sliding between two panes of glass. Breathe easily, lengthen out thru the top of the head, and imagine your shoulders melting away from your ears. 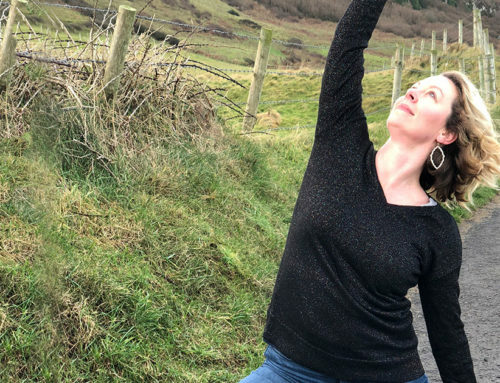 To go deeper into the posture, one shifts the hips in the opposite direction of the hands for further elongation of the tensor fascia latae (TFL) and the waist. The TFL is the muscle on the side of the hip that blends into the iliotibial band. Hold a yoga strap or hand towel between your hands and gently pull out. This will activate your shoulder girdle in a different way and will eliminate the problem of struggling to bring your hands together. Balance challenges? No fear. You can perform Half Moon with your back against the wall. Want more support for your back? Place your left hand on the wall and arch to the left with your torso and right arm. Transform Half Moon into a restorative posture. 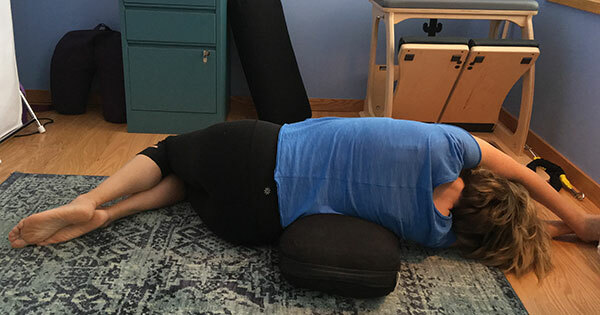 Place a bolster on the ground next to your hips. Extend over the short length of the bolster. Options to have your arms extended and resting overhead, supporting your head with a pillow, or resting it on the ground. 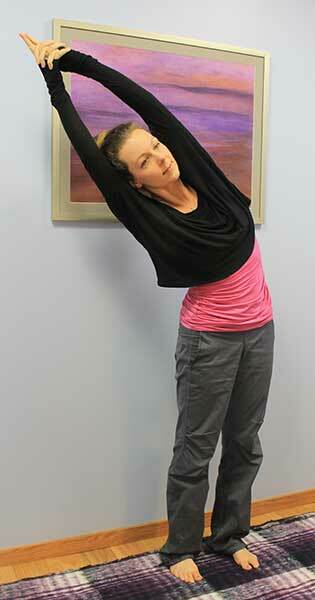 For students with gastrointestinal issues, this can be a helpful posture for releasing gas and encouraging digestion. This posture is particularly helpful for managing constipation. Sometimes our day to day movement is more forward and less side to side. The large intestine comes up the right side of the body, takes a 90 degree turn to continue across, then takes another 90 degree turn to come down the left side. 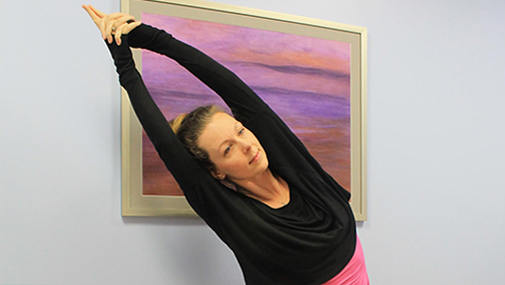 Expanding and breathing with this posture may encourage the digestive process. Allowing the sides of the body to stretch also may help with overactive bladder, interstitial cystitis/painful bladder syndrome, dysmenorrhea, and endometriosis. Anytime we are affecting the spine or diaphragm will have a direct relationship to the pelvis. Additionally, most adults need more opportunities to move in a variety of ways as we are often stuck in prolonged sitting postures during the day. This is a posture that you don’t need to get down on the ground for and can easily do at your cubicle. Prepare for Half Moon by performing Extended Child’s Pose as a warm-up. Walk your hands, arms, and shoulders to the right. Breathe into the left side of the rib cage, expanding out to the side as you breathe in. Exhale, allowing your body to settle towards the floor. Hold for 5-10 breaths and repeat on the other side.